The boom years immediately after the Great War bring nothing but happiness for wealthy industrialist Wigmore Stratfield-Whyte and his wife Clarissa – until tragedy robs them of their greatest treasure. Many years later, an horrific fatal accident brings young Meg Chandler, a spirited farmer’s daughter, into their lives. Meg wants nothing to do with them, but Clarissa is drawn irresistibly towards the bereaved girl and will move heaven and earth to help her. Will Meg allow Clarissa into her own shattered life, and can the two share a future happiness together? And will Meg’s new acquaintances bring her the contentment she craves – or seek to destroy her? Set in the Kent countryside in the years leading up to the Second World War, this compelling saga tingles with drama, tension and an overwhelming sense of love. 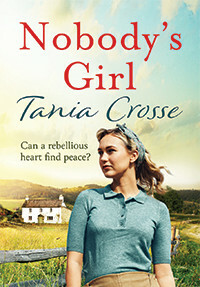 Tania was inspired to write Nobody’s Girl and its sequel, A Place to Call Home, when Winston Churchill appeared to her in a flash vision at his home of Chartwell in Kent. Although the settings and characters for her stories are entirely fictitious, she was very much influenced by the subsequent research that she carried out into the Churchills’ private lives.